It’s summer. It’s hot – hopefully. You’re out and about and desperate for a drink so you pick up a bottle of water at, say, a gas station. You take a sip and suddenly feel like you’re doing something horribly wrong. Why? First, you're drinking from plastic. Second, it’s not aluminum. Here are 10 reasons why it makes sense to drink from an aluminum water bottle, preferably one made by Laken, a worldwide leader that’s been at it since 1912. 10. If you drink from a plastic water bottle, you may feel like you’re one of the only ones left doing so and well, you actually might be. In fact, there’s considerable talk of banning plastic water bottles – at Vancouver City Hall, in Waterloo schools and San Francisco and Philadelphia municipal offices have already done so. 9. There’s no chance of the ‘steely’ after taste some people have reportedly experienced with stainless steel bottles. 8. They look good - whether in solid brights (pink, green, red, orange) or with cool designs (monsters, skull & cross-bones, flowers). Laken bottles are also available in a screw cap or easy twist spout style. The twist spout features an extra twist locking mechanism to prevent leaks. Both styles are easy to clean and dishwasher safe. 7. At .65mm, the outer walls of Laken bottles are 30% thicker than all other aluminum bottles, making it the most dent-resistant aluminum bottle around. 6. Laken bottles are made in Spain, not China. 5. Aluminum is more lightweight than stainless steel. 4. Using a Laken instead of plastic water bottles means you won’t be adding to landfill waste. 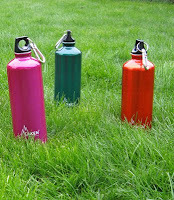 Laken bottles are made from 100% recyclable aluminum. According to the American Recycling Institute, only 14% of plastic water bottles are recycled. Those that are recycled are really being ‘down-cycled’, converted to a lower form of plastic, much of which goes unused. 3. Even if you fill it with juice, or other sweet, acidic liquids, a Laken will not rust as has been rumored to happen with some stainless steel bottles. Its inner coating is an epoxi-phenolic material recognized and approved by all major health authorities (Canada, US and Europe). It is guaranteed not to flake or crack like competitors’ enamel coatings. Laken’s inner coating is the same lining used in many pharmaceutical applications and is the safest protection known today. 2. Laken coats the entire inner surface of its bottles, including below the thread line. This is an important (and distinguishing) feature for Laken as it ensures that no liquid comes into contact with the aluminum. 1. Reduce the risks associated with bisphenol A (BPA), a potentially harmful and controversial chemical found in polycarbonate plastic, which is the material most plastic water bottles are made from. Recent research has shown the chemical, which mimics estrogen and is a known developmental, neural and reproductive toxicant, can leach from bottles into the contents. After a draft report from Health Canada found BPA to be potentially dangerous to infants and the environment, the federal government is moving to ban baby bottles containing BPA later this year. Our Laken water bottles a completely BPA-free. Check out our selection of Laken bottles for adults, teens and kids at Lavish & Lime.